Before I get started – is overabundance an actual word??? Why does it seem like its not? I had a bunch of arugula left over from my Roast Beef panini endeavor the other day and I just couldn’t let it go to waste. I try very, very hard that whenever I purchase food (especially fresh produce) to use it all up before it becomes a science experiment in my veggie drawer. Most of the time they end up in an omelet, frittata or a veggie pasta, but arugula is bit different. I would say that it’s a bit of an acquired taste because of its peppery and slightly bitter flavor. So anyway, what to do with all this arugula? I knew we couldn’t eat it in salads over the next two or three days so I decided to make a pesto because it would keep in my fridge/freezer for a good amount of time. 1. Bring a large pot of water to a boil. Create an ice bath in a large mixing bowl with water and ice. 2. Place walnuts in a dry (no oil) sauté pan over medium heat for roughly 5 minutes. Be sure to stir them a few times so not to burn. Remove from heat when done and set aside. 3. Once water has boiled add arugula and blanche for roughly 15-20 seconds. Remove immediately from water, strain and place in ice bath. Once completely cooled, squeeze excess liquid out. 4. In a blender or food processor (a FP would be easier, but I couldn’t find mine – still unpacking – so I used the blender) add the Arugula, walnuts, parmesan cheese, lemon juice, and garlic. Pulse a few times, and then slowly start to incorporate the EVOO by drizzling it in slowly while you pulse. Continue to pulse until fully incorporated. This should make a very thick paste-like substance. If you want it thinner you can add more oil. Thoughts: ZOMG! – really that’s what I first thought when I did the little taste test. You can pick out each of the three main ingredients, but yet they also all blend together into this vibrant green and to die for pesto. I based the recipe off my basic basil pesto, but blanched the Arugula because I’ve noticed that when you cook Arugula it mellows out a bit (and I read an article a long time ago that recommended it). In all honesty I think this has easily become my favorite type of pesto. The next day I sat at work just thinking about how good it was, and the moment I got home I took a spoon and dug right in. (I should be shameful of this, but somehow I’m not.) BD also fell in love with it. We’ve used the leftover in two separate dishes and I’ll be posting those recipes later this week. But you could also use this as a dipper for some really yuumy and crusty bread. So if you are a pesto fan in anyway, I really recommend you give this a try the next time you’ve got a ton to spare. Great idea for leftover arugula. 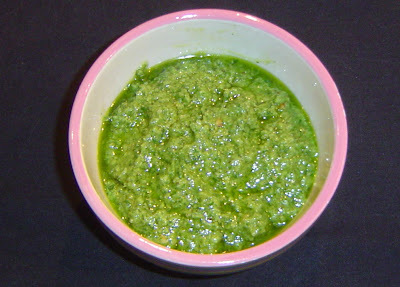 Wonderful pesto! Cheers! Fantastic looking pesto, we often make it with rocket/aragula it tastes spectacular. This is my type of food .... yummmmmm!